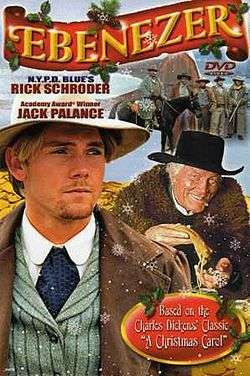 Ebenezer is a 1998 Canadian made-for-television re-telling of Charles Dickens' classic A Christmas Carol with Jack Palance giving a performance as Ebenezer Scrooge, á la Western genre. After a half-century of screen presence, in one of Palance's final projects before his retirement. A TV film with high production value, it debuted in the United States on Turner Network Television. It is an obscure and rarely seen title. Ebenezer Scrooge is the most greedy, corrupt and mean-spirited crook in the old West and he sees no value in "Holiday Humbug." But when the ghosts of Christmas Past, Present and Future open his eyes, Scrooge discovers that love and friendships are the greatest wealth of all. There were at least 2 DVD pressings produced. One was by Platinum Disc Corporation and the most recent by Lionsgate Home Entertainment in 2005, but not believed to be in general release at this time. The original VHS version is long out of print.